I feel the need to caution people about using harnesses on active dogs. I believe that harnesses are better than collars for dogs when they are being active. However, a harness does have one big downfall for active dogs. It can cause severe harness chafing if you’re not careful. My warning harnesses chafing primarily applies to smaller dogs, dogs with thin skin, dogs with little hair, and/or overweight dogs. Keep in mind it can happen to any dog though. My caution is that, no matter what harness you use, you should periodically check to make sure your dog is not being rubbed or chafed. How Do I Know if My Dog’s Harness is Rubbing? The one way to know for sure if your dog’s harness is chafing is to check regularly while you are hiking or walking. The most common place for chafing to occur under your dog’s arm in the armpits. The second most common place is on the rib cage or abdomen. It can also happen on the neck, back, or face if you use a head-lead type harness. Hair loss where your dog’s harness comes in contact with their body. Spots on your dog that are rubbed raw, red, and potentially warm to the touch. Irritated spots on your dog’s skin that looks like a rash. If y our dog’s harness is chafing them, try to figure out why. That can help you decide whether you need to get a different harness, make some adjustments, or work on training. What Causes A Dog’s Harness to Chafe? Many factors can cause a dog’s harness to chafe and cause irritation or hair loss. A harness that is too tight or too lose. A harness that sits directly in a dog’s armpits. A dog that constantly pulls against the leash. Dirt or sand getting trapped between the harness and your dog’s skin that acts like sand paper. I also find it depends on how close your dog’s legs, or elbows, are to the body. For example, I have Dachshunds and there is not much space between the leg and body in the arm pit area because of their dwarfisim. Dogs that are overweight often have more “cushion” on their legs and body and this can cause the space in the arm pit to be narrow than most dogs. The smaller space alone can put pressure on the harness in that area and cause movement because the leg is constantly moving against it. If you notice your dog’s harness is rubbing or chafing, first inspect it for fit. Adjust it if you can so it’s not too tight but also not lose enough that it shifts around a lot or easily allows dirt and sand to get trapped between the straps and your dog’s skin. It’s possible that you may need to switch to a collar or a different fitting harness until the chafed spots heal in order to truly tell if the adjustments helped. If you adjust the harness the best you can and it still doesn’t look like it fits right, or is still causing chafing and discomfort, you will need to get your dog a different harness. If the problem is that your dog keeps pulling hard on the leash, train them to walk on a lose leash. Disclaimer: some of the articles below are affiliate links, which means that we get a few pennies if you make a purchase to help support this blog (and we really, really appreciate it!). Others may be products I’ve purchased or a company has sent me to try. As diligent as we try to be as pet owners, sometimes accidents happen. It’s happened to my dogs a few times and I’ve heard stories from others. Some situations that come to mind are…. I LOVE Ruffwear dog gear so I was excited when I got a Webmaster Harness for Chester and Gretel. I thought it made them look like real badasses on the trail. We went on an amazing hike to Broken Top Mountain in Oregon. It was a sunny day but we crossed several streams. They started to slow down and lag behind on our way back to the trailhead but I thought they were just getting tired. However, I felt really bad once we got back to the hotel. I took off their harnesses and realized that the harness straps fit tightly into their armpits. When the webbing got wet, dirt stuck to it and had chafed them raw. Although I loved the harnesses, we weren’t able to use them again because I just couldn’t get them to fit right. Another situation involved a harness that I recommend for Dachshunds. I received a message from a reader saying that she bought one for her dog but was very upset that it injured her dog. I asked her to tell me what happened and she said that her and her pup had a busy beach weekend with lots of walks and running. When she got home and took the harness of, she was horrified that he was completely chafed in both arm pits and was bleeding. I felt really bad but explained that it wasn’t so much the harness that caused the chafing but the wet combined with the sand and lots of running. Although the harness is meant to fit into a dog’s armpit, I’d never had or heard of an issue with it if it stayed dry. What Should You Do If Your Dog’s Harness Rubbed Them Raw? If you get home and notice that your dog has some raw, red spots, there are some things you can do to help with their discomfort. Putting water on the irritated skin can hurt but it may be necessary to gently wipe the skin to remove dirt and debris. Once the raw area is dry, you can apply a skin healing balm or a skin healing spray like this one or this one. Try not to use the harness that caused the chafing until the skin heals. That means you may have to take a break from activity for a while or use a different harness that doesn’t touch the sore spot(s). Which Harness Do You Use for Hiking with Your Dog? I’ve tried several different harnesses for my dogs. They’re Dachshunds though and their funny shaped bodies are notoriously hard to fit. I’ve found one harness so far that fits pretty well and that we’ve never had an issue with it chafing (and we’ve been using it for a couple of years). It’s the Casual Padded Y-Harness for Dogs. As you can see by the picture above, the chest strap does slide a little to the side because of my dog’s pointy breastbone but we’ve not had any issues because it body strap does not sit in her armpits. It also has some neoprene padding to provide cushioning between the strap and the dog. Has your active dog ever experienced chafing from a harness or collar? Excellent post. When Mort wore a harness (he doesn’t often now – most of the recreation we do is largely off-leash), his wore off the fur in that general area. Luckily not to the point of redness, but he lost most of his fur — he doesn’t have that much! I actually ended up sewing some fleece “padding” for the “armpit” area harness that helped. I think if we do a long leashed hike I’ll certainly have to make a harness with padding or fleece wrapped webbing again. I worry that fleece would be to bulky but I used duct tape once (it fixes everything right? Ha, ha). It, sadly, didn’t fix the issue as I had hoped. I am not giving up on that harness yet though because I love the other features. 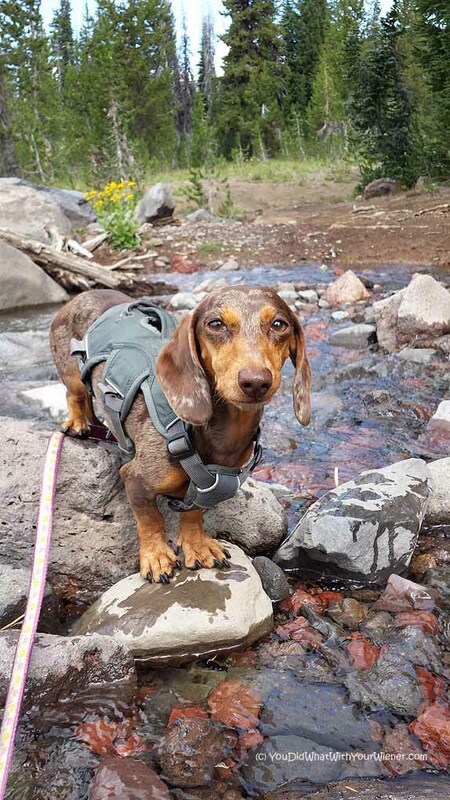 We have several harnesses when we take our dachsie on vacation or romps where she might get wet….we change them and dry out the others frequently, and keep her toweled off too. She won’t complain unless she really hurts, so there is no warning from her while having fun, that she is chaffing, etc. It’s probably more of a small dog issue but I can see it happening to dogs of any size under the “right” circumstances. Thanks for the words of warning. Nike wears the same harness that C & G wear – just a much larger version – and she wears it every single day because, like you mention, a harness provides a lot of extra control, especially for a big dog. I’m pretty aware of how her harnesses fit her, but a reminder like yours is always welcome. Sometimes we get busy with everything in the world around us and it’s easy to forget to check something so simple. I often get so caught up in our adventures that I forget to check. It’s gone a little more than I am comfortable with a little more often than I would like. I have to keep reminding myself! We haven’t had this happen with our harnesses, but we often have chafing problems in our chihuahua (small with totally naked armpits) when wearing coats. We have solved the problem by sewing fleece material to the armpit area and/or putting a doggie tshirt on underneath. I bet similar solutions would work for harness chafing issues. Good luck! Thanks Melissa. I worry the fleece would be too bulky (there is already hardly any room in there) but a t-shirt might help in some situations (it would be a total mess on our muddy hikes though). Yes, fleece might only work on something less tightly fitting than a harness. Leeloo’s tshirt (and coat) often get totally disgusting on muddy/wet hikes, but the tshirt still prevents chafing! Also I should mention it has to be a tshirt with little arms (not the kind that just has leg holes). Scooby (chihuahua) wears the four paws harness. Its the only harness that we have found that doesn’t cause him problems. Ma does rotate every few weeks between collar and harness. When we are out and about he wears his harness and when we are home , he is either naked or with collar. I would think that maybe a piece of soft cotton or fleece like from a blanket or sweatshirt would help in areas of chaffing. It wouldn’t be as bulky as if you used lambswool fleece. Thanks Carma. The chafing is not a big issue for us. It only happens on occasion and is mostly influenced in the conditions of the day (wet, sandy, hot, etc). It happens ALL OF THE time with one particular harness so I avoid using that one unless I am testing a new method to stop the chafing.I really like it for a lot of reasons so I don’t want to give up. I always carry another harness though and change it out as soon as there us a sign of an issue. I might try a thin piece of fleecy material on that one. Have used the “Hug-a-Dox” harnesses (sold by Dachshund Rescue and Placement) for many years on many Dachshunds and never had a problem with chaffing or anything else. I highly recommend them! Do you have a link to them Debbie? I would be interested in taking a look at them. 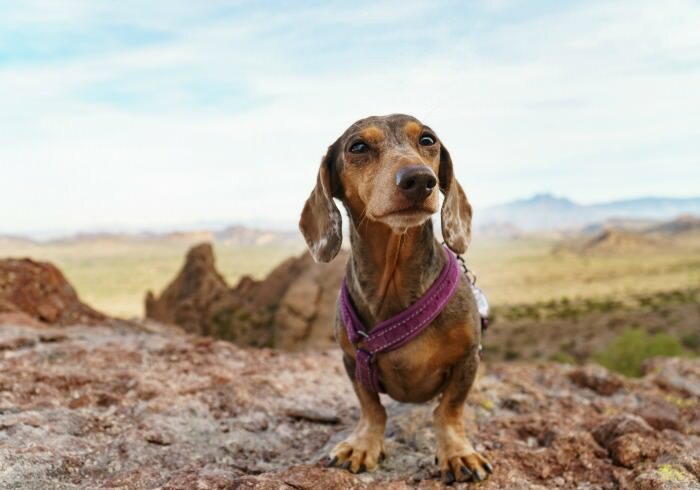 I have used the Hug-a-DOG harness by Dachshund Delights and like it for many situation, but walking distances and being really active is not one of them. I am curious of the ones you are talking about are different. This is a really excellent post. The same information can be applied to gentle leaders as well. I don’t have any issue using them on my dogs because their snout fur is a bit thicker and longer than most dogs. However, I used one on a Great Dane foster and it would rub his snout raw. We had to really limit the amount of time we used it. Reading this made ME hurt. I’m a new dog owner – adopted my first dog early this last spring. He’s a little doxy/chihuahua/who-knows mix, and it took quite a round of harnesses to find one that fit him. I couldn’t tell you how many we tried, but we visited four different pet stores (two big box, and two independent). Most of the harnesses placed the buckle right in his armpit – even the allegedly high-end brands. Ouch! It must just be because he’s such a funny shaped little dog? Once we found a harness that fit and was comfortable, we bought two. I had never, ever worried about him getting things under the harness that would work on him like sandpaper. Thank you so much! Welcome to the world of dog ownership and congrats! I’ve owned a dog for 12 years and new things still come up that I never thought about. It’s great that we dog owners can learn from each other. Yep!! We’ve had that problem, too! With the stupid Easy Walk Harness. I would never use that thing again. I’ve had better luck with the Wonder Walker and Hurtta Harnesses. I’ve also recently gotten to try out the new harness from Ruffwear and I’m liking it a lot, too! You are very right that you have to stop and check their armpits frequently. You just never know. The EasyWalk is anything but easy! I think Matilda is too small for even the smallest size, because I can’t seem to adjust it in a way that actually keeps her from pulling. And she looks so uncomfortable in it. Something I would add is that you should not use a no-pull harness of any kind on a dog being asked to run, hike, walk for long distances, swim, etc. No-pull harnesses (most of them being front clip) are designed specifically to restrict the movement of the dog’s front legs- that is how they work. A dog who is running, swimming, hiking, etc, in a harness that restricts movements is risking injury. Also, I can’t see the blog hop list, or where to link up. I found this article really useful, thanks! Having two small dogs we will only use a harness for walking and although not really ‘active dogs’ I do keep an eye on all parts of their bodies to ensure they are comfortable. I hadn’t really thought about sand and grit getting stuck there though. Ouch! It would be like sanpaper, you’re right! I’ll also add: if you have a very short-haired dog with fragile skin, you’re going to have to do whatever it takes to get the harness straps away from their front legs. Silas would never be able to wear a harness that fits as close under the arms as Gretel’s pink one in your photo. (Although I’m sure lots of dogs are fine with it, given how many harnesses are designed that way.) I’ve found that we have to buy “roman style” harnesses to move the belly strap further down his torso. Lupine makes the only Roman-style I’ve seen for larger dogs. Thanks for the tip Jessica. I LOVE Lupine products because of their guarantee. Chester and Gretel’s first harnesses were from them. I still have them and use them as backup…especially over jackets with no harness hole (that can’t be modified). Gretel chewed through two and all I had to do was take it back to the store I bought it from for an exchange. I got lucky last year when asked to review a harness for both dogs. The My Canine Kids harness is adjustable, and doesn’t go clear down to their arm pits. I have been thrilled with them. Thanks for mentioning it. I’ll take a look at them. We will observe Vaks when we go on a trip. I’ve been using the wrong kind of harness for awhile – my dog tends to pull and we’ve been using a back clip one. I’ve been browsing around trying to find a good replacement so this article is extremely useful (and the comments). We’ve been lucky that we didn’t encounter any chafing issues so far. I’m starting to realize I need multiple harnesses for different outings – one for hiking, short walks, jogs, etc. OMG…that is what it so fun! Having a million harnesses. Ha, ha. I don’t always use the “proper” one for each activity but we have one or laying around camp, one for walking and one for hiking. We end up using the pink mesh one you see in the photo for most things though. It works so well for us. I guess that could be a problem. We have heard of it happening with dog seat belts. We wear harnesses for our tracking, nose work and seat belt, but not for walking. So true! I have a couple of harness that *I* love but they just don’t work on Chester and Gretel. Excellent article! I once bought a harness for my English Bulldog that caused a rash under her arm pits. I was so surprised when I saw it. I think more pet parents need to be aware that just because a harness looks good and is a better option than using a collar attaching a leash they need to monitor their dog when in the harness to make sure it is the right match/fit for their pet. I’ve always thought harnesses a gentler means of control than collars or choke chains but, as with everything, safety reminders are helpful. Love your blog! Yes, I see them as gentler means too. There are hidden risks with everything though. Unfortunately, I had to learn the hard way myself. Hey girl what brand harness do you recommend for dachshunds? We’re having troubles finding a good one that doesn’t hurt his armpit areas. Please help! Matilda has never chaffed from a harness, but I really wish dogs could tell us – I wonder if harnesses are really tested to make sure they’re actually comfortable. The harnesses she has now are just straps, and they seem awkward, I can see how she has to move differently to keep it from slipping. I’m looking for her next one, it’s difficult because she’s a tiny chihuahua mix. Last time I went to PetCo, the only harness that fit her was in the cat section! 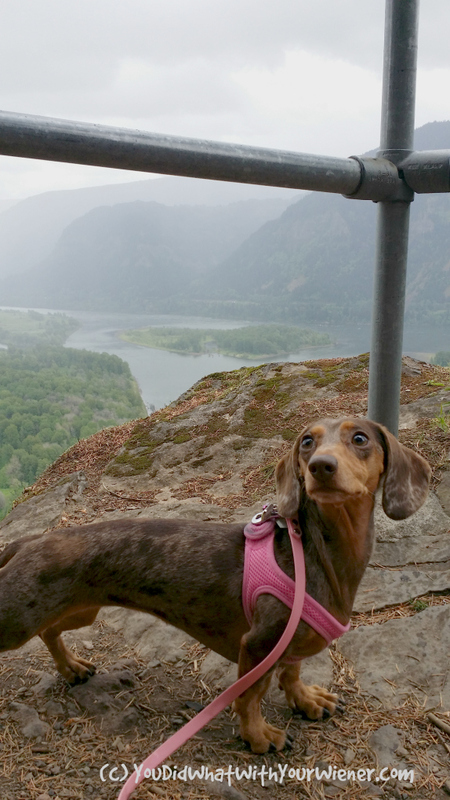 I tried many many different harnesses with my shorthaired miniature dachshunds and the only ones that have not caused any chafing are the Good2Go No Pull Dog Harnesses that I bought at Petco! Hi Brandy. These are, by far, our favorite harnesses: http://youdidwhatwithyourweiner.com/our-favorite-for-dachshunds-velpro-choke-free-mesh-harness/. Dachshund Delights makes a good, custom vest harness. I’ve heard really great things about Buddy Belts too. This harness fits him the best and is mesh so it is breathable, we put moleskin on the side pieces and that seems to work very well. and Timberwolf makes great collars that don’t cause any rubbing or fur breakage around his neck. We use the alpine rope collar- 5/16 size on our dog and so far it has not caused any rubbage. We have that RC Harness. It works but it still put pressure on Gretel’s windpipe when she pulled hard on the leash. We now use the VelPro Choke Free Harness (http://youdidwhatwithyourweiner.com/our-favorite-for-dachshunds-velpro-choke-free-mesh-harness/) and love it. Gretel has been wearing it pretty much 24/7 since her back injury and crate rest restriction. That’s been one month and there has been no breakage or thinning of her hair. The size she has fits here pretty loose though. I used to have problems with Chester’s neck hair breaking off when he wore a collar all of the time but he’s worn his harness for up to 10 days when we were camping and travelling and didn’t lose any hair (and his fits rather tight). The Velpro harness is pretty much made out of the same mesh as the RC pets one. Still, our “perfect” harnesses can cause chafing if they get wet and dirty on hikes. I’ve tried a ton of harnesses and I’ve yet to find one that doesn’t eventually chafe at some point. Very good post. We have actually gotten 5 different harnesses. Switching it up every day or so. Sure we have a favourite GO TO. Switching it up has helped avoid the fur rubbing off. Also, it has forced us to watch how each type of harness affects his stride, his gait, his ability to jump and how far etc. Now depending what type of hike we know what harness to reach for. I use a harness on my rescue lab mix and we just started running and last night I noticed his right armpit area is raw and very red and inflamed. He tends to pull to his right. But it scared me because I’m thinking the worse like mite infestation and even bad food allergy. I’m hoping that it is only due to the harness. I’ve been putting betadine and neosporin to avoid infection. I will lay off having him wear the harness and hopefully it will get better. We’ve been having trouble with our Box-a-dore (boxer/lab mix, 98 lbs) getting sores in her armpit area as well. We have the Easy Walk harness. I don’t know if it’s the shape of her legs or not. The PetSmart trianer fitted it for her and said it should be tight so it doesn’t rub; however, after that, she again got a bad sore. It makes me sad. I may try the Wonder Walker that someone mentioned. I usually taker her on shorter walks – about 1 to 2 miles at the most). She does pulll as I can’t walk as fast as she’d like. Please email me with any specific suggestions for our type of dog. Thanks. Hi! I know this page is from a few years back, but I’m glad I found it! I have a dachshund mix (call him a chiweenie, though not 100% sure), and I’ve run into chafing problems. I know you recommend the mesh Velcro harnesses, but Pickles is 21lbs and pretty strong, and I’m afraid it wouldn’t be sturdy enough. We haven’t been in a big hike yet, though I’m planning one for this summer. He actually has the grey harness the pup is wearing in the first picture, though we haven’t used it much. How has that one worked? Any chafing issues? Thanks! Hi Sam. I am an active blogger and keep my site relevant. If my opinions on a harness changed I would have updated this post. The Velpro mesh harness is still my absolute #1 recommendation for Dachshunds. The harness does not put pressure on their trachea and is very strong. My dogs are only 12 lbs but I would not hesitate to use it if they were 25 lbs. I am curious about your harness though because all of the pictures in this article feature the Velpro mesh harness and it doesn’t come in grey…. so you can’t “have the one in the picture”. Does yours have a label on it? I am curious what you DO have. If it IS the Velpro Harness but it’s black (the closest to grey they sell), then my answer is I love it and everything I said in this article is true. We’ve tried a lot of other harnesses too though so if it’s no the Velpro mesh let me know. I might be able to give you my opinion. Really good tip about harnesses for dogs. I never considered sand and how exfoliating it can be. I always use a harness for walking or hiking with my dogs. For my little one Phoebe, I use a soft harness most of the time. My Husky is a different story, she requires a serious no pull harness! I always take off their harnesses once we are back in the house though. They also both have a good amount of fur so chafing isn’t much of an issue. I learned the hard way not to let my dog play with other dogs off leash in a harness. We did that once and another dog’s paw got stuck in my Husky’s harness! It was awful. He yelped in pain and because he was stuck he became frightened & it almost led to a serious fight between them! I take off the harness before heading into the dog park or any off leash area now. We are having the worst time trying to find a harness that won’t do this. I found one that seemed to fit well and not even ten minutes into our walk- He has to wear a cone… and is absolutely miserable. I wish I could upload photos and show you- he is a very active little guy- very lean, but his chest is 16 inches- his neck only 9. Finding a harness to fit seems inpossible. Hope my email helped. Good luck. I certainly get how frustrating it is. So what harness do your doxies wear. I have bought three different ones and none seem to work. They all rub and chafe. Hi Angel. That’s the tricky part about harnesses and dogs and chafing. What works for one doesn’t work for all. However, what I’ve found works is the VelPro Mesh Choke Free harness (my review below) for casual everyday and the Hurtta Padded Y Casual harness for hiking and wet weather since it doesn’t sit in her arm pits.